First, the raisin bread. This is composed basically like a cinnamon roll, but put into a loaf pan, rather than sliced up into sticky buns. 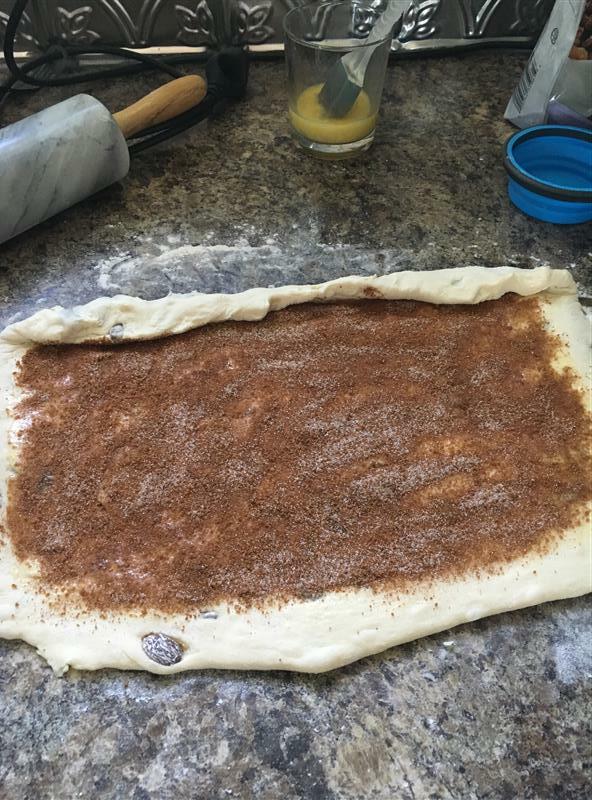 I made a double batch of the dough, and added the raisins and cinnamon mixture to only one of them, with the intention that the other one would be sandwich bread. I shaped them and left them to rise, and promptly forgot about them. As a result, they overproofed, and when I disturbed them to put them into the oven, both loaves sank. Instead of having a lovely spiral swirl, I had a very short loaf, and had to cut it on a diagonal like a baguette to get a decent sized slice. I never quite got around to making the “rum raisin french toast” out of it, but spread with peanut butter, it makes a delicious breakfast! Next up was the cherry pie. 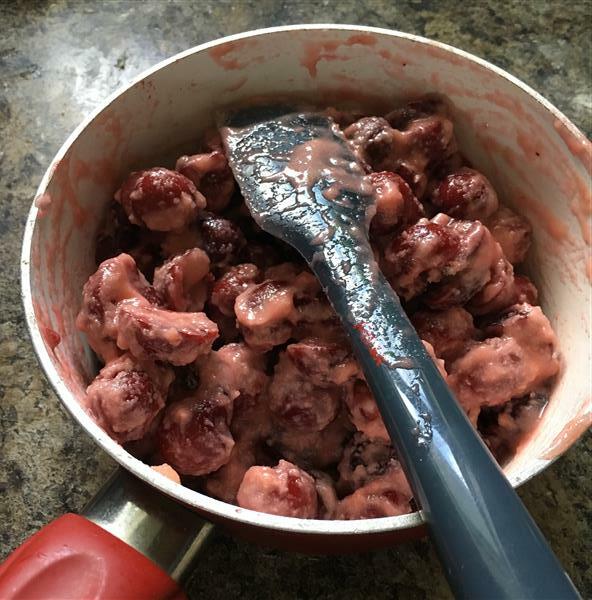 I used frozen cherries, because we’re still a couple of weeks away from local cherries, here in Southern Ontario. 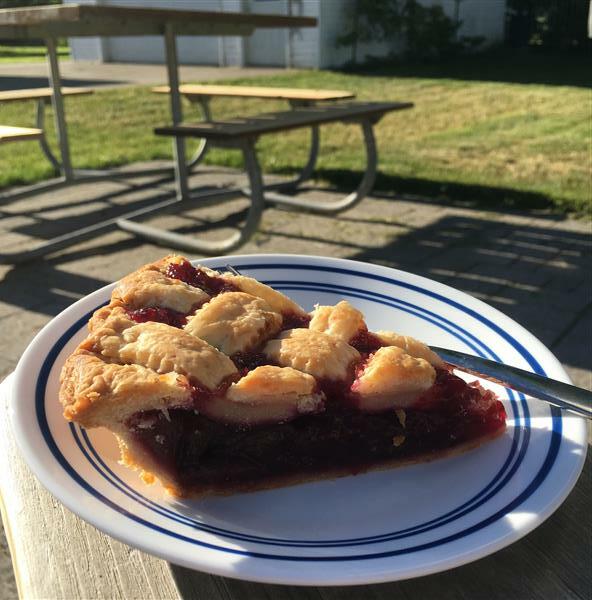 One thing I love about Rose’s fruit pies is that the filling is almost always thickened in some way or another before being put in the crust. 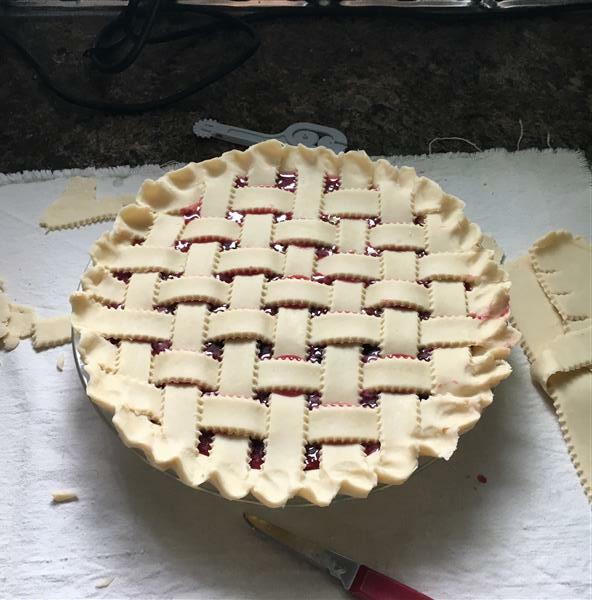 It takes a little longer to prepare, but given the variability in water content from one apple or peach or cherry to another, it’s the only way to have any clue what type of texture you’ll end up with in the finished pie. Proper preparation prevents poor performance! Another reason I ❤ Rose: taking the mystery out of lattice crusts. They’re so pretty, and deceptively complex looking, but easy to do! Of course they never look quite as good after coming out of the oven as they do going into it, but this one was pretty good, all things considered. Then I made a cheesecake. 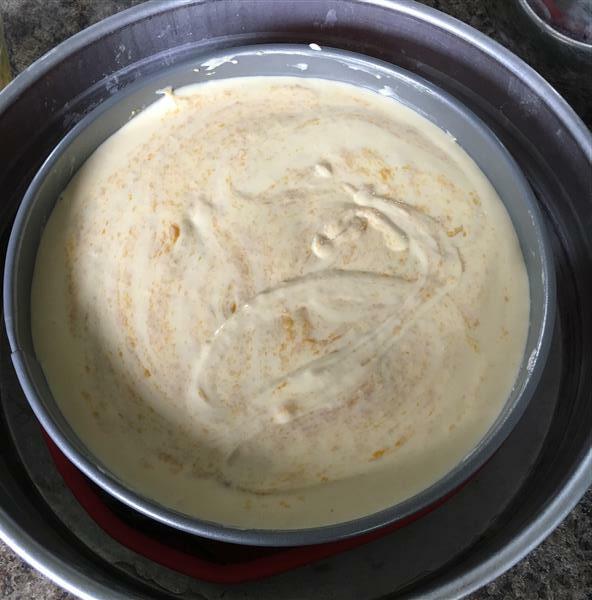 It’s pretty similar to Rose’s ‘basic’ cheesecake, with yogurt substituted for the usual sour cream, lime for lemon juice, and some thickened mango puree swirled into the batter. First dot the filling with small dollups of the mango puree. Then swirl it in with a small whisk, so that it doesn’t stay in clumps that separate out from the creamy goodness. Bake, cool, then top with more slightly thickened mango puree. 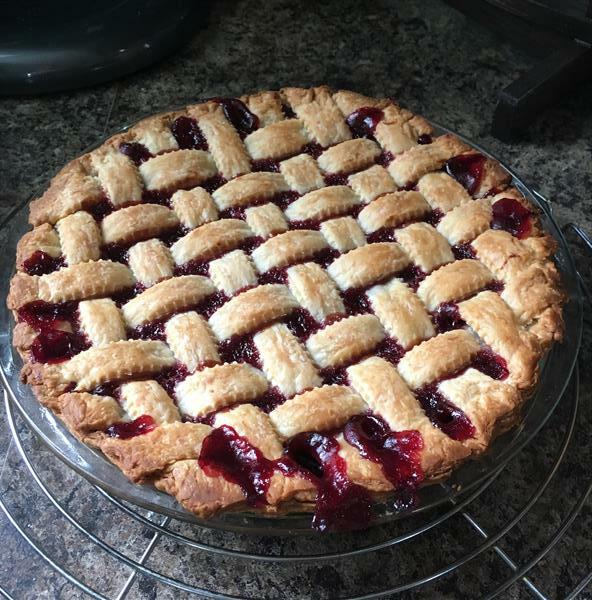 Since I sent the remainder of the cherry pie with Jay to his (also fairly new) co-workers, I ended up sharing this one with my own new co-workers on day 2 in the office. On my tour of the office, it was made clear where the treat table was. I just might be able to take a hint. When I posted in the relevant slack channel that there was cheesecake, an almost immediate a response came back from Gilad saying “oopse.. I need to start getting to the office earlier.” I really missed working with him, and it’s great to already have a friend at the new place! The cheesecake was definitely a hit around the office. I found it a bit on the tart side. That’s likely because I wasn’t paying close attention and bought 0% fat greek yogurt, not full fat. 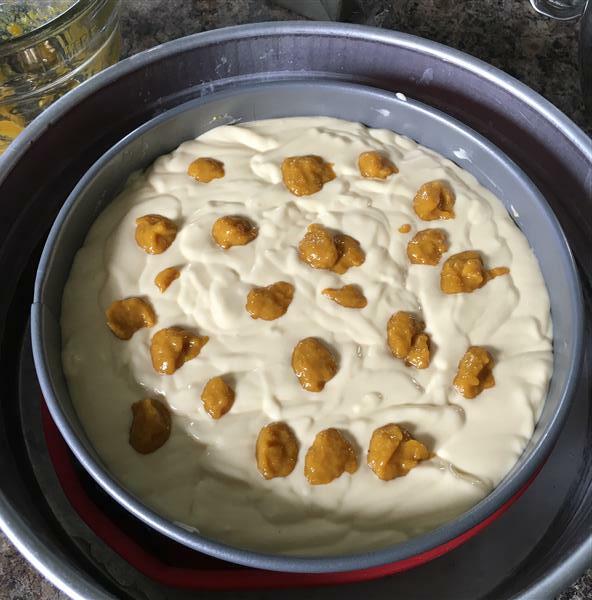 The skim yogurt is also probably why several people commented on it not seeming as rich as a normal cheesecake, but that seems to have gone over quite well. It’s a small company and a small office, so it didn’t quite all disappear before I went home for the day. As a result, I got to bring a piece home to Jay, who also appreciated it. I wasn’t quite convinced of the use of a sponge cake crust, but that’s easy to change next time. Whew! I think that catches me up for both baking and blogging. Time for bed! 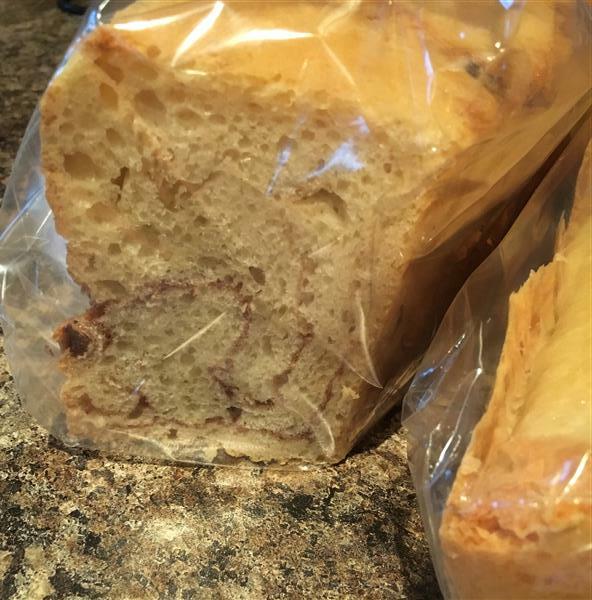 Posted on June 21, 2016 July 13, 2016 by KristinaPosted in The Baking BibleTagged cheesecake, cherry pie, mango, raisin bread. Oh my gosh that is a text book perfect lattice pie crust! I’m having trouble finding full fat Greek plain yogurt; lots of zero fat available. 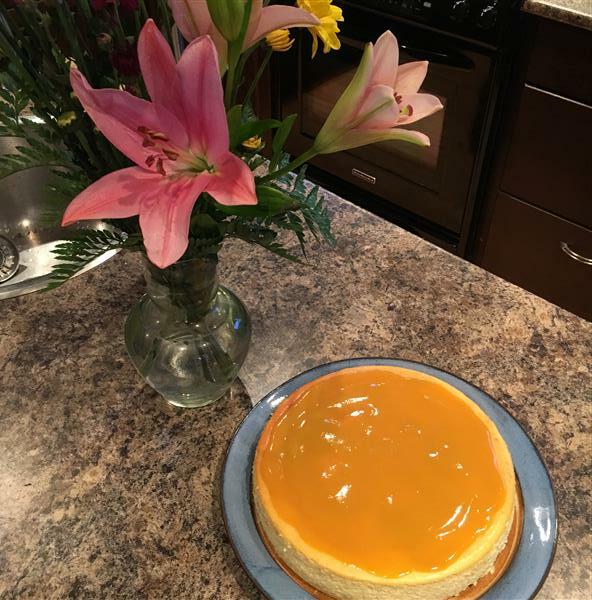 The topping on your cheesecake goes perfectly with your flowers. Congrat’s on the 5k and new job. By the way, you look really good with your hair tucked up. Shows off your great cheekbones. congratulations!!! and your pie is exquisitely beautiful!